Acne (also known, as acne vulgaris) is the most common skin condition in the United States. It occurs when your hair follicles become plugged with oil and dead skin cells. 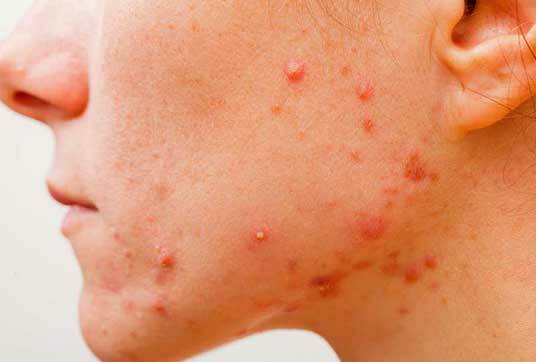 Acne is most frequently seen among teenagers, but it can affect individuals of all ages. The most common locations include the face, chest, upper back, and shoulders. There are many effective treatments available, however acne can be persistent. Depending on the severity of the disease, acne can cause significant emotional distress and can leave permanent scarring. Cleanse acne-prone areas with gentle soap or cleaners. Use products labeled “water-based” or “noncomedogenic” to help reduce clogged pores. There are several over-the-counter acne medications that may help your acne, if used on a regular basis. Benzoyl peroxide is perhaps the most effective over-the-counter treatment and is available as a variety of forms and strengths. Benzoyl peroxide tends to dry the skin. So, if you are prone to dry skin, consider using a weaker strength (for instance, benzoyl peroxide 2.5-5% concentration). If you are prone to oily skin, consider using a higher strength concentration (for instance, benzoyl peroxide 6-10% concentration). Caution benzoyl peroxide can bleach your clothing and towels. Exfoliating agents containing salicylic acid, sulfur, resorcinol, glycolic acid, or lactic acid can also be helpful but can cause some dryness of the skin. If treatment does not improve with self-care, you should consider seeking further medical care. Our doctors can help control your acne and avoid scarring with a combination of topical therapies, oral medications, and procedures. Retinoids (vitamin A derived products) such as tretinoin, tazorotene, and adapalene. Isotretinoin (a strong medication for severe acne unresponsive to the above treatments). Steroid injections directly into acne lesions. If you are interested in learning more about treatment options for your acne, please call Heller Dermatology & Aesthetic Surgery to schedule your appointment!